Aaargh! Who remembers the Invasion of the Gypsy Moth in Summer of 1981? That August, they were literally everywhere and on every thing. They covered entire houses and cars, engines and tires, walkways and entire roadways so that you couldn’t drive down the road without hearing hundreds of them pop under the tires or walk down the street without the caterpillars swinging in a heavy curtain from every branch…it was a nightmare! And now, they’re back and I am totally horrified! Last summer, we were inundated with the Gypsy Moth again. Some areas got it worse than others, and still not as bad as that summer from my teenage years, but bad nonetheless. Our entire area was defoliated and it looked like winter in summer. I was grateful to see that the trees started the regrowth process before August so that we had some color for the Fall season and I hoped all was not lost. what? We had a very mild winter this year and I hiked a lot. I believe that the mild winter conditions is a contributing factor to the millions of GM hatching right now from those powdery, light brown egg sacks you see everywhere. I am not a scientist, but based on my own observation and calculations, I believe they have actually hatched much earlier than usual. On my winter hikes, I was on a mission to destroy every egg sack I could reach that I saw. But that won’t solve the entire problem, or even put a dent in it, unfortunately. I am a tree-hugger, naturalist and a believer in the statement “live, and let live.” Yes, I am that person who will capture a spider and deliver it to the wild outdoors in order to save it from being squashed by someone else. That being said, there are a few insects that I despise and go out of my way to kill and I don’t even feel bad about it…cockroaches, ticks and GYPSY MOTHS! Luckily, up here in the quiet, northwest corner of RI, we don’t have much concern for cockroaches, as they only exist under the worst circumstances, so problem solved there. In my heavily wooded area where ticks are common, proper precautions are taken to combat ticks. * As for dreaded Gypsy Moth infestation, it was so bad last year and food sources became scarce, that they even attacked my giant white pines! I am not a fan of chemical pesticides and when RI, CT and MA experienced awful infestation conditions in 1981, the state’s solution was to douse the entire area with the highly toxic carcinogen, Malathion, which did rid the area of the moth. However, those toxic chemicals fell onto our homes, outdoor furniture, children’s play areas, pets, livestock, organic produce, wildlife and waterways (not to mention everything else that’s important to us!) and killed off a large portion of bees and fish! I am so grateful they won’t do that again, however, that leaves us, as homeowners, to make a choice on how we treat our properties. Do we spray harsh, toxic chemicals, endangering ourselves and our families and pets or choose a more natural options. Either way, there are way too many trees, and way too many egg sacks to find and treat and will take endless days of repeated application to eradicate on this moth. But I think we should at least try! We are going the all-natural route, FYI!! These creatures are not native to the U.S. They were brought into Massachusetts from France in 1869 for the purpose of starting a silk trade industry and are native to Europe, India, Asia and Northern Africa! The experiment went horribly wrong as the caterpillars escaped the confines of incubation and have been a major pest for us ever since. The gypsy moth caterpillar is not a fussy eater. It has a preference for the leaves of deciduous hardwood trees such as maple, elm, and particularly oak. Gypsy moths can also feed on apple, alder, birch, poplar and willow trees. As it grows it will also attack evergreens like pines and spruces. Gypsy moths appear to dislike ashes, sycamores, butternuts, black walnuts, dogwoods and balsams. However, during heavy infestations, competition for food will drive the caterpillar to attack almost any tree or shrub. 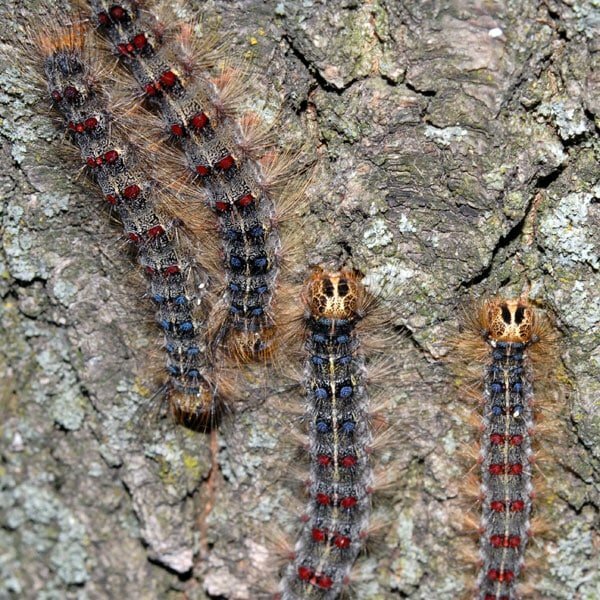 The gypsy moth can be combated at the egg and larval (caterpillar) stages. Egg masses, when discovered, should be burned or soaked in water. If the egg masses are unreachable, spray them with a strong dose of Horticultural Oil Insect Spray. Spray in the late fall as well as a few times in the early spring, before leaves begin to form on trees. To prevent the caterpillars from reaching the foliage, use a Bug Band (as shown in my newsletter). Use a Bug Band to protect nearby trees as well. In addition to the two options I gave in my newsletter here is another option: Attract the flying male moths into the trap. As the females can’t fly, they wait for the males to come to them in order to reproduce, by giving off a scent that attracts the males. The trap works by disrupting the gypsy moth’s reproductive cycle by attracting and trapping the adult moth before mating can occur. Each mated female can produce as many as 1,000 caterpillars the following spring. This product uses female pheromones to attract the males and traps them in the container. This product covers about 1/4 acre. With the infestation we have, this jar will need to be emptied daily. Natural predators of the Gypsy moth are a few species of birds (most won’t eat them, though) wasps and beetles. Mice, voles and shrews will feed on pupae that are found at the bases of trees. Chipmunks, skunks and raccoons will feed on larvae and pupae and squirrels will feed on pupae. Two diseases are especially important for controlling GM infestations. One is a virus that occurs naturally among large, dense, widespread infestations and is called NPV, nucleopolyhedrosis virus. It is very important in the collapse of major outbreaks of GM and primarily transmitted by the female moth to the offspring. This disease sets in when the group is stressed for food and occurs naturally 1-2 years after the initial outbreak. The caterpillars affected by this virus will hang in an upside down V from the trees. There may be hope for Rhode Islanders next year! The other is a fungus, called entomophaga maimaiga, also occuring naturally by overwintering in the soil where spores are released in early spring affecting the caterpillars. It reproduces in wet, warm weather conditions, which we do not have right now. Affected caterpillars will hang upside down from the trees to dry out, releasing spores carried by the wind and when the carcass falls to the ground and decomposes. That cycle can continue to work magic to eradicate the GM as long as the weather remains moist and warm. The spores are said not to affect any other insects, plants or mammals. If you need a 100% organic, plant-based, natural solution to the skin rashes caused by GM, you might want to try a few products from PUREhaven Essentials! Our Dream Cream is never greasy and hydrates the skin, and softens and soothes and is really great for dry skin and comes in Vanilla, Lavender and Peppermint. Our line of Essential Oils and blends are good for a variety of uses including bug repellents and revered for their restorative, health and healing properties. Our oils can be purchased individually or in a complete set. Give me a call for your specific needs. I also have a Bug Spray Workshop coming up soon! I’ll keep ya posted!